Iris Recognition vs Retinal Scanning – Is there A Difference? This document explains how each biometric ocular identification technology works and the differences between the two. The human retina is a thin tissue composed of neuralcells that is located in the posterior portion of the eye. Because of the complex structure of the capillaries that supply the retina with blood, each person’s retina is unique. The network of bloodvessels in the retina is so complex that even identical twins do not share a similar pattern. 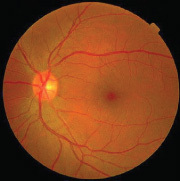 Although retinal patterns may be altered in cases of diabetes, glaucoma or retinal degenerative disorders, the retina typically remains unchanged from birth until death. A biometric identifier known as a retinal scan is used to map the unique patterns of a person’s retina. The blood vessels within the retina absorb light more readily than the surrounding tissue and are easily identified with appropriate lighting. A retinal scan is performed by casting an unperceived beam of low-energy infrared light into a person’s eye as they look through the scanner’s eyepiece. This beam of light traces a standardized path on the retina. Because retinal blood vessels are more absorbent of this light than the rest of the eye, the amount of reflection varies during the scan. The pattern of variations is converted to computer code and stored in a database. Retinal scanning also has medical applications. Communicable illnesses such as AIDS, syphilis, malaria, chicken pox well as hereditary diseases like leukemia, lymphoma, and sickle cell anemia impact the eyes. Pregnancy also affects the eyes. Likewise, indications of chronic health conditions such as congestive heart failure, atherosclerosis, and cholesterol issues first appear in the eyes. The iris (plural: irides or irises) is a thin, circular structure in the eye, responsible for controlling the diameter and size of the pupils and thus the amount of light reaching the retina. 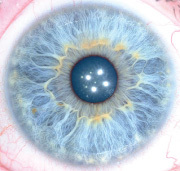 “Eye color” is the color of the iris, which can be green, blue, or brown. In some cases it can be hazel (a combination of light brown, green and gold), grey, violet, or even pink. In response to the amount of light entering the eye, muscles attached to the iris expand or contract the aperture at the center of the iris, known as the pupil. The larger the pupil, the more light can enter. Iris recognition is an automated method of biometric identification that uses mathematical pattern-recognition techniques on video images of the irides of an individual’s eyes, whose complex random patterns are unique and can be seen from some distance. Unlike retina scanning, and iris scan uses camera technology with subtle infrared illumination to acquire images of the detail-rich, intricate structures of the iris. Digital templates encoded from these iris scan patterns by mathematical and statistical algorithms allow unambiguous positive identification of an individual. Databases of enrolled templates are searched by matcher engines at speeds measured in the millions of templates per second per (single-core) CPU, and with infinitesimally small False Match rates. Hundreds of millions of persons in countries around the world have been enrolled in iris recognition systems, for convenience purposes such as passport-free automated border-crossings, and some national ID systems based on this technology are being deployed. A key advantage of iris recognition, besides its speed of matching and its extreme resistance to False Matches, is the stability of the iris as an internal, protected, yet externally visible organ of the eye. 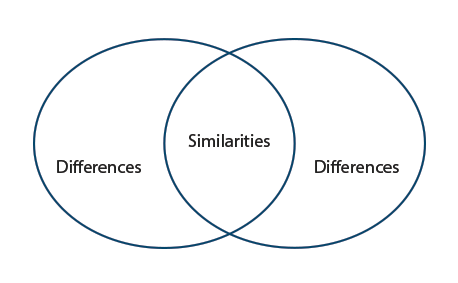 While both iris recognition and retina scanning are ocular based biometric technologies, there are distinct similarities and differences that differentiate the two modalities. Iris recognition uses a camera, which is similar to any digital camera, to capture an image of the iris. 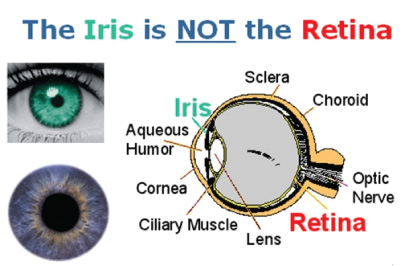 The iris is the colored ring around the pupil of the eye and is the only internal organ visible from outside the body. This allows for a non-intrusive method of capturing an image since you can simply take a picture of the iris from a distance of 3 to 10 inches away. Retinal scanning requires a very close encounter with a scanning device that sends a beam of light deep inside the eye to capture an image of the retina. Since the retina is located on the back of the eye, retinal scanning was not widely accepted due to the intrusive process required to capture an image. Iris vs. Retinal Scanning: What are the similarities and differences?